Are Guys Like Mike Wilkins the Next Generation of Main Eventer? The June 14th main event between Mike Wilkins and Eric Calderon was the first Gladiators of the Cage (GOTC) main event that didn’t feature Chris Dempsey in a long time. When you find yourself in the main event, for a promotion that is dog-fighting for market share in a major metropolitan area, the pressure is immense. There is high-caliber training to be concerned with, proper diet, day jobs and selling tickets to offset training costs; now let’s add that to the pressure that your fight is for the promotion that brought such Pittsburgh classic fights like Jaime Chesney vs. Jessica Richman (the first female fight in the metropolitan area), the grudge fight between Dominick “The Honey Badger” Mazzotta vs. Cody “No Love” Garbrandt and Chris Dempsey’s come-one-come-all title defenses. When Dan Bogan announced the red and blue corners for the fight, I noticed something. From my seat, I could see Eric Calderon egging on the crowd; I saw Mike Wilkins ready for war and I saw the crowd at Stage AE completely explode in adulation. Mike Wilkins was getting a heroes welcome and Eric Calderon was pouring gasoline on the “I’m fighting your fan favorite” fire. It’s that sort of cage psychology that just made Wilkins and Calderon much more substantial names than they had been moments prior. Theatrics and posturing aside, both men delivered. We all come to venues like Stage AE and the Greentree Sportsplex because of fights and we’re very particular, we want good fights. 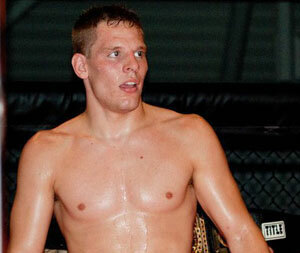 Mike Wilkins’ triangle choke finish was fast and definitive; it’s how your first main event should end. Then I had to think: are guys like Mike Wilkins leading the charge for the next generation of main event caliber fighters for the Steel City? The thought crossed my mind because I know that Chris Dempsey isn’t going to be fighting in Pittsburgh forever. I had to come to the realization that I’m not going to be able to keep guys like Chris Dempsey, Dominick Mazzotta, Mark Cherico, Khama Worthy, Francis Healy and Cody Garbrandt in my back pocket, in my regional scene, forever. If I know that these guys are championship caliber, then the brass for the main stage is going to know it too. By my estimation, we’re sixteen months to two years before those guys are fighting for Bellator or the Ultimate Fighting Championship. When they go, we will be very happy for them, but there will be a void left. Like any crown that is without a head to wear it, challengers will come. These challengers will not be sleepers; they will have had to do the work to earn their shots at the strap. I can proudly tell you that in my realm of regional fights, I have yet to see someone handed a shot because of association or need. We take championships very seriously and it’s that adherence to that standard that makes title fights worth seeing. These next-gen main event fighters are putting in the work now, fighting the fights put in front of themselves, testing their meddle and proving themselves one round at a time. To be painfully honest, I can’t even put a name to the next great Pittsburgh prize fighter. Our debuting amateurs are surprising me every day. For our debuting pro fighters, they have something to prove and much more often than not, they leave everything in the cage, regardless of how painful it is to do so. This piece is comprised of making the fight fans realize there is another stable of fighters coming their way, but also to tell the guys who are gate keeping and opening cards how much I really do believe in their potential. Truth be told: I have a short list (that isn’t that short) that I’d put up against any other state’s regional guys and would have faith that they’d win. I know that there will be future main eventers after our existing senior class moves on because I know there will be a growing fight scene that they leave behind. At each fight for GOTC and Pinnacle FC, the crowds get bigger. With each stellar knock out or submission from nowhere, there are people in the crowd dragging their friends to fights because there is something that can’t be missed. It’s getting to the point where there are more MMA Media Outlets dedicated to the Steel City and surrounding areas than I can count on one hand; and you know, there is more than enough MMA for all of us. As the scene grows, so will the Steel Nation Magazines, the Pittsburgh Sportslines and (with any luck) the Cage Nation TVs. To the next champion or the winner of the next great grudge fight: we’re waiting for you in Pittsburgh. Next Next post: Jon Rearick vs. Dan O’Neil 2 Set For November 1st?